Last weekend, E and I took a train down to Louisiana for a quick, two-night visit to my parents’ house in the country. We were eating a surprisingly sweet watermelon for lunch on Saturday when my father noticed it had something he hadn’t seen in a long time: a thick rind. It seems that watermelons are being bred to have increasingly thinner rinds because the red flesh is what most people care about. You probably haven’t missed the thick layer of white between the part of the watermelon that you eat and the green outer skin–unless, like me, you grew up eating sweet watermelon rind preserves on toast, made from a recipe that your grandmother probably got from her grandmother. We decided two things: First, that technology needed to preserve the recipe, so I immediately started taking photos of it with my point-and-shoot camera (unfortunately, I’d left my good camera at home); and second, that we needed to follow that recipe, no matter how time-consuming it was. Though the recipe itself was skimpy and vague in places (“boil up real good”), my parents had both made the recipe many times, so I trusted them to fill in all the blanks. Early the next morning, we found that my night-owl father had already rinsed off the salt and gotten the rind soaking in fresh water. So all that was left was to make an alum bath, a ginger tea, and a sugar syrup and boil the jars and canning lids to sterilize them. Soon, every pot my mother owned crowded the stove, and the kitchen grew as hot and steamy as a Louisiana summer. Because the recipe wasn’t completely clear, we made a couple of changes as we went along. After cooking in the syrup for about a half hour, the watermelon rind (or citron, as my grandmother called it) had become translucent, but the syrup wasn’t very thick. I made an executive decision to transfer the rind into the canning jars with a slotted spoon, add a little more sugar to the syrup, and let it cook down a little more before pouring it over the rind in the jars. This seemed to work well, and a couple of days later when we tested the preserves, the rind was tender but still retained some “bite” and the syrup was sweet (probably too sweet to most tastes) and lightly ginger-flavored. 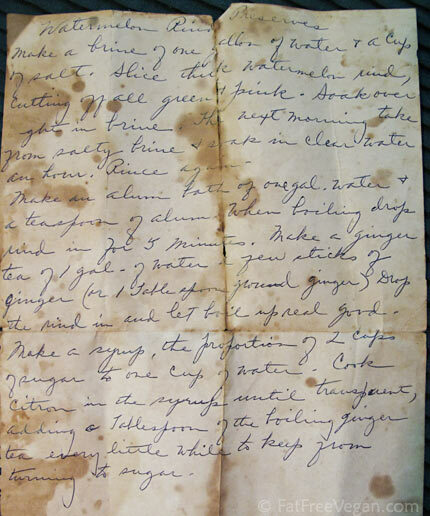 I’m glad I got the opportunity to make my grandmother’s recipe as-written, before the paper it was written on completely disintegrated. Since embarking on this experiment, I’ve done a little web research and found other, easier recipes for watermelon rind preserves, and if I find another thick-rind watermelon, I will definitely try to find a less complicated way to preserve it. Some versions include lemon or cinnamon or cloves, and I’d like to experiment with those flavors. My father suggested making the syrup with watermelon juice instead of water, and I think that would be a great way to increase the watermelon flavor and decrease the sugar. For now, I’m treating myself every now and then to a bite of this old-fashioned confection that reminds me of childhood and home. It’s full of sugar, so I certainly don’t call this a health food, but a little bit is good for the soul–my Louisiana soul at least. It was a lot of work but worth it to preserve an old family recipe with my parents and bring my daughter in on the tradition. I think I’m going to have to find more of my family’s old recipes to cook with them! Trim most pink and all of the green from watermelon rind. Cut into 1/2-inch cubes. Dissolve 1/2 cup salt in 1/2 gallon of water. Add rind, cover, and allow to soak overnight. Drain and rinse well. Cover with clear water and allow to stand for 1 hour. Prepare alum bath and ginger tea. Add alum to 1/2 gallon of water and bring to a boil. In another large pot, add ginger to 1/2 gallon of water and bring to a boil. When alum bath is boiling, add drained watermelon rind and cook for 5 minutes. Drain and rinse. Then pour rind into ginger tea and cook until it returns to a full boil, about 10 minutes. 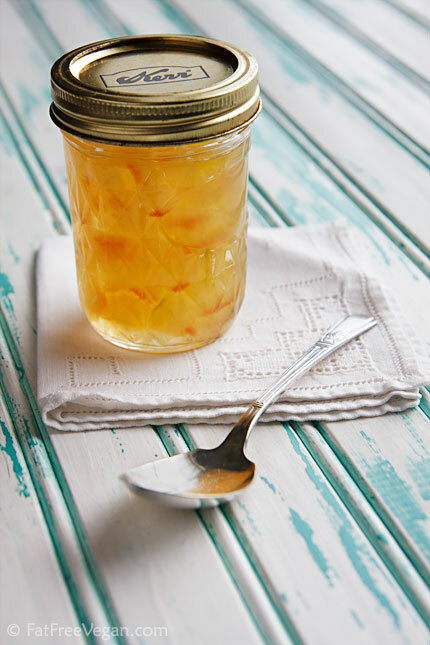 Use a slotted spoon to transfer the rind to sterilized jars. Continue to boil the syrup until it is about the consistency of maple syrup. Carefully pour the syrup over the rind, filling the jars to within 1/2-inch of tops. Make sure the rims of the jars are clean, cover with sterilized lids, and tighten bands. Reserve any leftover syrup for use in tea or on pancakes or waffles. Allow jars to cool and check seals. (Lids should “pop” as they cool.) Refrigerate any jars that do not have a tight seal. 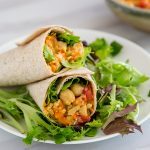 I’m no canning expert, so if you attempt this recipe, I recommend doing some research on canning first to make sure that the preserves will not spoil. Just to be on the safe side, I am keeping my jars in the refrigerator. What an intriguing recipe. The collaborative effort that went into preserving the recipe is simply lovely. Oh my gosh, my grandmother (Maw-Maw as we called her) used to make these. I don’t have any of her recipes – I doubt she had anything written down. I love to can but don’t have much time to do it these days. However, I am going to have to find the time to make these and travel down memory lane. THANK YOU! Thanks so much. I remember having these when we were kids. I have a recipe book of my mother’s that contains some interesting old time recipes that I also treasure. Most are definitely not Vegan, but they bring back memories and that’s what counts I think. I’m going to print this one out to stick into that book! How ironic! I was shopping at Whole Foods this past weekend and there they were-adorable little jars of watermelon rind preserves! I was so tempted to get one because of the novelty of it all and then the woman behind the counter said, “It’s very sweet!” and I thought to myself, “I’d probably down the whole jar in one sitting so I’d better leave that alone.” I’m loving that you shared your family’s experience and history with this food. Really great memories are oftentimes associated with a particular food. Wish I could have a little taste of your preserves! They dice the melon flesh and leave it to macerate overnight in 500 g sugar.Then the next day cook with lemon juice and some of the rind from 1 lemon cut into pieces with half a chopped vanilla pod. Boil for around an hour, watch carefully towards the end, don’t let it become a caramel. Susan, if I may ask , is this suppose to be a preserve as in a topping for toast or more of a sweet pickle conditment? Last year was my first year putting up “preserves” and I’ve thoroughly enjoyed doing so. Thanks for posting the recipe. Maria, this is definitely a sweet topping for toast, biscuits, or anything else you would put jelly or jam on. Very, very sweet, not like a pickle at all. Mmm. I am so going to try my hand at your recipe. Susan — we made your family’s recipe for watermelon rind preserves! I had them on biscuits, while my one of my sisters added some to her stack of pancakes. Definitely sweet but good. By the by, after sealing the jars, we put processed them via a water bath for a little more than 15 minutes as a means of preserving them for use over the course of the year. Thanks for the feedback! I’m so glad you liked them! What a great idea. I’m salivating already. 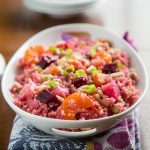 I’ve made the recipe from the U of Georgia’s National Center for Home Food Preservation and really liked it. It calls for a boatload of sugar, though. However, when I took it for samples at my CSA, lots of people commented that it tasted just like what their grandmother or old aunt used to make. Very old-fashioned kind of recipe! What a beautiful post, Susan! Thank you–the memories, the preserves, the revival and you all doing it together–and the photos are lovely. Ginger’s icky – sorry, it’s an aversion that more or less runs in the family – so do you have any other suggestions for what to flavour this with? I’ve never had watermelond rind preserves so it’s difficult for me to imagine the taste. So, flavours: Allspice? Nutmeg? Mahlepi? Another fruit? I have plenty of limes on hand. I think lime peel or slices (without seeds) would be good. Cinnamon and/or cloves would also be tasty. Absolute treasure! thanks for sharing your grandmother’s recipe in her own hand. I will definitely try this recipe out. That’s awesome! I have been wondering how people made it…someday I must, must try this! Seriously, this is really, really cool! This is beautiful and surely delicious! I think it’s so wonderful that you had the chance to make this recipe with your family. I also love that she wrote, “boil up real good” because it reminds me of my own grandparents. How cool, and how thrifty our grandparents were. It sounds like it would be very summery with the watermelon and ginger. Love ginger. If I were making this, I would put the jars in a boiling water bath as for other preserves; probably 15-20 minutes. Jars sealed just with the heat of the preserves are definitely not safe for long-term pantry storage but would probably keep for a couple-three months (maybe more) in the fridge. I loved seeing that old paper recipe. I’m wondering if it’s really necessary to use the alum? I buy alum-free baking soda and baking powder at our local health food store, so I just assumed it’s unhealthy. The only time I ever had pickled rinds, it was some people, the Peters family, from Boga Lusa (sp?) La. They were great people, and because of all their deep south ways, those of us in my N.J. village where they lived for just a year or two thought them very exotic! I missed them terribly for years when they moved back to La. Thanks for reminding me of them! The alum just helps keep the rind from softening or breaking down too much so that it’s still in cubes. Some recipes don’t call for it, so it’s possible to leave it out. 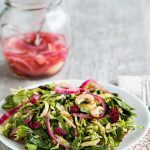 I’ve never heard of using watermelon rind, but this looks utterly fantastic, and perfect for summer! I’m so excited to try it, thanks for sharing! How much sugar was in the orginal recipe? The original recipe, which you can see in the second photograph, was unclear about how much syrup to make, but the basic proportion was two parts sugar to one part water. 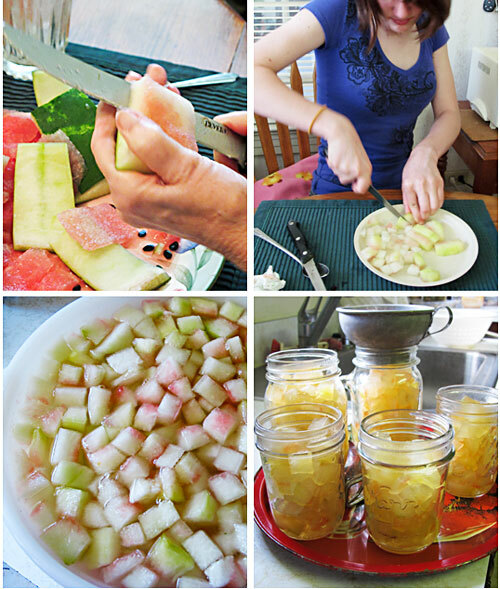 How much you need to make would depend on how much watermelon rind you’re preserving. I made this recipe and unfortunately is turned out terrible! the syrup turned brown very quickly and I think my watermelon got tougher in the syrup! I’m so sad. I’m sad, too! I don’t know why that could have happened. Well of course I just cut up a watermelon for smoothies, AND put the rinds out for the birds/squirrels/whoever, AND it had a nice thick rind, AND I read your post the day after I did this! The squirrels may not be so lucky next time- this looks fabulous and ready for the try list. By the way, the handwriting on the original recipe looks spookily like my own grandmother’s handwriting- makes me wonder if everybody back then had the same penmanship teacher! wonderful. so glad you found her recipe. I remember eating this growing up. Susan, I don’t at all care for watermelon but my goodness did this charming post and the recipes it highlights make me smile. In fact, I can’t stop grinning! I wish my family had a proper set of heirloom recipes. I’m hoping I can compile a few in the event that I have children. Enjoy your preserves! Do you know i just threw out 2 huge watermelons worth of rinds?? And this was yesterday… ugh! I wish i was here sooner!!!!!! 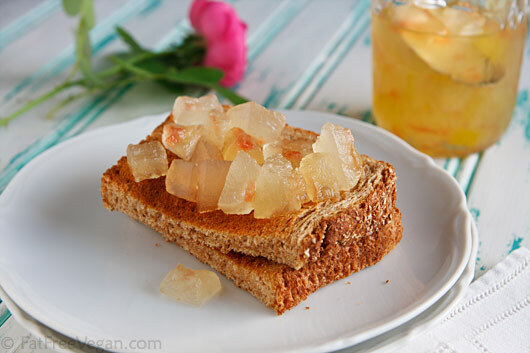 I made pickled watermelon rind and it is very similar to this. It has vinegar, but is incredibly sweet and you would never guess it had vinegar in it (sort of like cinnamon apple slices). I am sure the taste is quite similar. It also called for lemon slices. I am sure I will make more. So far as the canning aspect, I am NOT trying to be disrespectful of your grandma’s recipe, but today’s canning guidelines would render it unsafe for shelf storage. This recipe does not have enough acid to be considered safe for waterbath canning. That is why vinegar is usually added. The high sugar content can also prevent the growth of botulism spores, but acid is considered key. Most fruits are high enough in acid to can, but figs, melons, and asian pears are supposed to be acidified. Additionally, the jars would be processed (boiled) in a water bath canner before shelf storage. It is good that you are refrigerating. That said, these are lovely and have worked for your family for many years. They look delicious and beautiful. I liked the recipe . Is there Any scientific reason to use alum in the recipe? please let me know? The alum is to keep the watermelon rind crisp. You could leave it out if you don’t care about that. Do keep the jars in the refrigerator, though. The recipe really needs more acidity to be properly preserved. In reviewing my blog stats, I just realized you linked to my recipe for Watermelon Rind Preserves. Thank you so much! When I saw your mother’s hand written recipe, it looked almost exactly like my mother’s! In fact, my recipe was ‘modernized’ from Mom’s old recipe (which, of course, she got from Grandmother.). Watermelon Rind Preserves were a Christmas time treat in our house. Now that our parents have passed, I make these & send them to my brother. This old recipe always wins a ribbon at the State Fair of Texas. You might enjoy my modern Chai-Spiced Watermelon Rind preserves. They won, too. If you are ever in Dallas, please stop by & let’s cook together!! Thanks again. P.S. In regards to using watermelon juice, in a word – don’t. I made Watermelon Jelly once (original recipe). Never again. All the flavor is in the red pulp. The canning process separates the red pulp and the water. The clear water ends up taking like, well, clear water. Very, very sweet clear water. The red pulp ends up grainy. I think Erin may have cut the pieces too large. The same thing happened to me once. I can A LOT every summer & enter the State Fair of Texas. Again, if you’re in Dallas some summer, it would be fun to can together! Sally, both of your recipes look delicious, and I’m really eager to try your chai-spiced one. After I made my grandmother’s recipe, I thought “Isn’t there supposed to be lemon in there?” It was missing from the instructions, so I didn’t add it, but wish I had. I’m from germany and really intereset in your delicious looking recipes at that blog. They are so much inspiring. The recipe of that watermelon reind preserves above is very catching me, too. I wanted to ask you something abut the ingredients, because I don’t really understand what alum is. What is it needed for in your recipe and do you think there is a possibility to substitute/replace it? I think it’s not well known in Germany and I don’t know if I can buy it in my small homewtown. You would really help me with answering my question. Thanks a lot! Today I bought watermelon and ate some and I remembered our favorit jam mom used to make for us (5 brothers) back in the 50’s. The rind was cut like a pickeld long cucumbers and soked in a white Lime ? water which made it very crunchy and very soft and sweet inside. I tried to find this in Meditarian or Grecce deli stores with no luck. I will be calling my sister in law and get the receipt. If I am succesful I will email you the receipt. this jam is very popular in middle eastern countries. I live in a country where I can`t can preserve things. Can I just make a half batch and keep it in the fridge for a while? I believe grandma really did mean “citron” in her recipe, or at the very least something citrus-y. Lemon or lime would also work. Reading the recipe, it wouldn’t make sense to boil the rind in the ginger tea, then make the syrup and boil the rind in it until clear, then put it back in the tea again, would it? Maybe, I dunno. She calls the rind “rind” the whole time, so to come up with a new word which is also a citrus fruit doesn’t make sense to me anyway. I think this would taste great with a bit of citrus, and it would help balance out the sweetness. I am going to try this the way I read the recipe, and instead of alum i will use vinegar water since the alum is just making an acidic solution (and i love apple cider vinegar!). Thanks for sharing the original document, I just love looking at that sort of thing. To be sure your jars are safe to store on the shelf and not refrigerate: I use the old fashioned method of using a pan large enough to turn your jars upside down in water and bring to a boil, until the water is sucked up into the jars: steralize the lids in a separate pan…fill the jars immediately, seal and set aside. When the lids SNAP DOWN they will make a snapping noise. Let them cool before storing. As long as the jars are steralized properly, the contents should not spoil…..especially jams and jellies as the sugar alone will keep them. 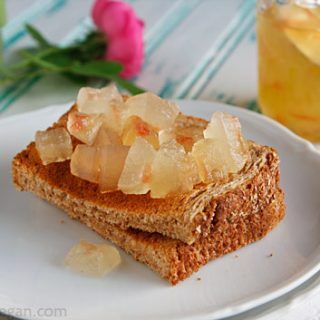 Glad to have found this site as I was wondering what other recipes there were for watermelon rind preserves. My husband who is from Louisiana told me about a memory he had of heading towards Leavenworth, Kansas with his family during the early 70’s, as his father was in the Army, and along the way they had the chance to visit a processing plant that made watermelon rind preserves. Since my husband had recently purchased a yellow-fleshed watermelon recently, we thought we would make some preserves with it. We found a recipe in our Ball Blue Book (1984) Guide to Home Canning and Freezing and followed the recipe exactly except for the part about using ground ginger. 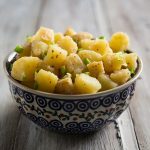 Instead, we used grated fresh ginger root, which was about a 4 1/2 – inch tuber and substituting that for the 1 tablespoon of ground ginger called for in the recipe. While making the recipe, I too thought the recipe called for a bit too much water, (7 cups water to 4 cups sugar to 1 1/2 quarts watermelon rind) which resulted in a thin sugar syrup, as I was expecting a thicker syrup. Next time I will follow your suggestion to remove the rind and add more sugar and cook the syrup down a bit longer. I look forward to trying it as I have never had watermelon rind preserves, though my husband has. Thanks for your blog on this recipe. Trim green skin from pink (or yellow) flesh from thick watermelon rind; cut into 1-inch (25mm) pieces. Dissolve salt in 2 quart (1900ml) water and pour over rind. Let stand 5 to 6 hours if salt is used. Drain; rinse and drain again. Cover with cold water and let stand 30 minutes. Drain. Sprinkle ginger over rind; cover with water and cook until fork-tender. Drain. Combing sugar, lemon juice and 7 cups water. Boil 5 minutes; add rind and boil gently for 30 minutes. Add sliced lemon and cook until the melon rind is clear. Spoon rind chucks into hot pint jars until near shoulder of jars and ladle hot syrup on top, leaving 1/4-inch (6mm) head space. Remove air bubbles. Adjust caps. Process 20 minutes in boiling water bath. Yield: about 4 to 5 pint jars. You can process any leftover syrup or store in refrigerator to use as a fruit drink concentrate. My Mother-in-law from SC made watermelon preserves using cane syrup which they made on the farm. The rind is soaked in sugar overnight. Squeeze out water. Put in a heavy pot and cover with cane syrup. Slowly cook until tender and chewy. I’ve adjusted it and use half sugar and half cane syrup since I’m not crazy about cane syrup and it’s also hard to find. I use Steen’s 100% cane syrup from Abbeville, LA. I have made watermelon preserves for better than 40 years and you don’t need to refrigerate as long as your deal is good. FYI: This is how I’ve done it all my life from my Mother and Grandmother. Watermelon, sugar, little bit if water and a few drops of cinnamon oil. That’s it. I cook it down on the stove and place in clean jars no need for a water bath. The preserves will keep forever I’ve never had a problem with them. Hope that helps ease your mind. It’s really good with a bit of cinnamon in it.